Republican People's Party (CHP) leader Kemal Kılıçdaroğlu last week gave a very informative interview to Andrew Finkel of the Taraf daily. The media has focused on Kılıçdaroğlu's comments about the theoretical profile of the CHP's future candidate for the 2014 presidential elections. The person Kılıçdaroğlu described is an independent and popular personality, capable of challenging Recep Tayyip Erdoğan. This electoral strategy has naturally monopolized the columns, and no attention has been paid to Kılıçdaroğlu's answers to Finkel's questions regarding the CHP's approach to the economy. Now, these answers deserve careful analysis, since the performance of the CHP in the next elections will depend heavily on the credibility of its economic policy. Let me state at the outset, it is my sincere opinion that Kılıçdaroğlu's comments about the economic performance of the Justice and Development Party (AK Party) reveal the CHP's lack of understanding as to how the ruling party managed to increase its voter support from 34 to 46 percent in 2007, and further to 50 percent in 2011. As long as the CHP is unable to comprehend the reasons for this increase in popular support, it will be unable to formulate a consistent economic policy. Without such a policy, it cannot convince floating voters of its capacity to secure Turkey's stability and growth. Without the support of these floating voters -- indeed, free-minded voters who place importance on economic stability -- the CHP may see only a limited increase in votes as a consequence of setbacks faced by the AK Party due to domestic and international issues. It cannot hope to challenge the AK Party's incumbency. In the interview, Finkel pointed out the 8 to 9 percent economic growth over the past two years, and asked how Kılıçdaroğlu saw fit to challenge the economic policy of the ruling party. Kılıçdaroğlu responded that the average growth rate for Turkey between 1923 and 2002 was 5.5 percent, as compared with 5.7 percent during the AK Party's leadership. This, he said, is not an impressive performance. However, Kılıçdaroğlu is mistaken here. Firstly, you cannot compare these two time periods, for the simple reason that the rate of growth declines in the long run due to capital stock deepening. This is the rule of thumb in growth theory. Secondly, the average population increase was much higher between 1923 and 2002 than in the last decade, and consequently 5.7 percent growth yielded higher per capita income than the older 5.5 percent growth. This factor has a major impact on poverty, as I will discuss below. If Kılıçdaroğlu's argument was that Turkey's 8 to 9 percent growth is unsustainable as it has been based on domestic demand and fueled by external borrowing, reaching now a period of decline, this would have been fair criticism. But, rather, he argued that there are millions of people unemployed in this country, and meanwhile Turkey imports agricultural products. I do not want to spend a long time proving that these are totally irrelevant matters in judging the health of the economy. Let me simply say that Germany also imports a high quantity of agricultural goods, and that the unemployment rate in Turkey is currently lower than it was in 2002. Finkel was unsatisfied with this answer, asking, “According to you, how has the AK Party succeeded in increasing its electoral support from 34 percent to 49 percent?” The CHP leader began to state that there is no internal democracy in the AK Party, while it flourishes in the CHP. “But,” Finkel insisted, “how have they increased their votes?” Kılıçdaroğlu's answer is so absurd that it would not be out of place in an Ionesco play. This fact, he said, is yet to be sociologically analyzed, and further, the AK Party promised a new prison in Diyarbakır and did not see a decline in voter support -- this is not possible in a democracy! To my mind there is no mystery in the AK Party's success. Rapid economic growth, with some interruption during the most recent economic crisis, helped to decrease poverty and lessen financial inequality by increasing wage employment and per capita income. An implicit proof of this assertion is that the AK Party lost 8 percentage points, going from 46 percent to 38 percent, in the March 2009 local elections, a time when unemployment was at its peak and gross domestic product at its lowest. To convince the public that they are capable of implementing a successful economic policy, the CHP must first recognize the realities of the current situation. As I have always argued in this column, given the limitations of domestic demand-led growth, the Turkish economy risks becoming trapped in low growth if the government fails to implement productivity and cost-reducing reforms. The CHP should think seriously about these issues. The only policy suggestions emerging from the Kılıçdaroğlu interview concern decreasing income tax on the minimum wage to 1 percent, and the necessity of improving education in order to produce high value-added goods for export. 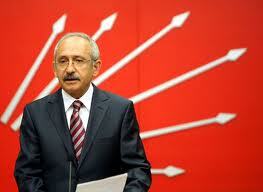 I do not know if Kılıçdaroğlu is aware of the consequences of a tax rate decrease at the bottom of the rate structure. Decreasing income tax rates is rather a neoliberal policy, and Turkey faces the problem of tax evasion rather than with the rates themselves. Regarding education reform, who would not espouse its importance? But what will you do with a current labor force averaging seven years' schooling, until the reforms take effect, at the earliest, in 10 to 15 years?